I remember that day well. I was the Air Reaction Force (ARF) team lead for a combined US and Afghan 8-man quick reaction force (QRF) that was flying racetracks above the objective on standby in the event of an emergency. We got the call to go in almost immediately after the initial infil, just after the fighting started and things started to go badly. As we hit the ground I can remember the chill of the ice-cold river water on the valley floor making contact with my feet through my boots. I had the vulnerable feeling that my element was almost completely exposed – the impact of enemy automatic rifle fire could be clearly seen and heard just ahead as we made our way forward towards the fierce fire fight that was raging only several hundred meters up the valley. When we could no longer move under cover I made the call for my element to set up a fighting position where we could support ODA 3312 which was just up the valley from our position. ODA 3312 was run by their warrant and the Team Sergeant, Master Sergeant James Lodyga. If my memory serves me they were short a team leader due to their detachment commander, then Captain Bob Cusick, having been wounded a month or so prior on the same night that Robert J. Miller earned the Medal of Honor posthumously for his actions. Map: Shok Valley is located in the remote mountainous province of Nuristan – highlighted in red. ODA 3312 was about 200 meters up the valley from my position and at the base of the steep hills and sheer cliff faces that ODA 3336 was attempting to negotiate down in order to get out of the direct line of enemy fire. Sadly my element lost one of the Afghan Commandos that was attached to my ARF to enemy gunfire in the river that day. I believe that one of ODA 3336’s most trusted and competent interpreters lost his life that day as well . . . I’m pretty sure his name was CK. One thing is for sure; while there was more than just one ODA on the objective that day, ODA 3336 was without a doubt the most exposed element on the ground. Due to the extreme nature of the terrain, the ODA found themselves – for a substantial portion of the fight – cut off and exposed to a massive amount of sustained enemy fire. The team did not have the luxury of any of the other elements being able to cover their withdrawal as they made their way down a virtual shear cliff. I can still remember to this day the horribly helpless feeling of listening to Master Sergeant Scott Ford call out over the radio for assistance for his team. You could clearly and distinctly hear the life start to leave his voice as the blood ran out of his body. I was so relieved to find out in the days following that he had survived his gunshot wounds and was expected to live and make a full recovery. In the end ODA 3336 proved to be almost larger than life on that day with most of the team members receiving Silver Stars for their actions. One event that comes to mind is then Staff Sergeant John Wayne Walding sliding down the cliff with his severed leg held tightly in one arm and clutching his M4 rifle in the other. 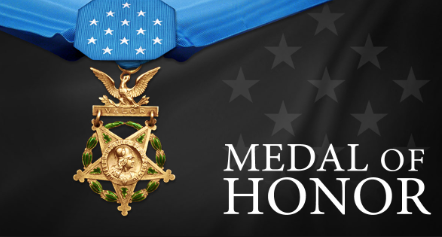 It was during this time that Staff Sergeant Shurer went above and beyond the call of duty by displaying a level of bravery that is just as deserving as any who have received our nations highest honor in the past. I can recall being on the radio talking in both UH-60 Blackhawk Medevac birds as they came into a hot LZ in order to guide them under an electric power cable that ran from a generator on one side of the valley to a fortified fighting position on the other side of the valley. Staff Sergeant Shurer saved the lives of a lot of guys that day and he deserves all the honors and accolades that he can get. His actions were no less than heroic and he is a great example of the caliber of men who are serving in SF today. By the time we got extracted we were all physically and mentally exhausted. Everyone was low on ammo and water, and my team was out of 84 mm recoiless rifle rounds for the Carl Gustaf. After more than 6 hours of fighting in the river bed and the ridge lines, at the end of the day the ODA 3336 JTAC dropped over 20,000 lbs of ordnance onto this giant enemy strong hold. Some of the bombs were so close to our fighting position that boulders the size of Volkswagens came flying off the side of the mountain coming to rest uncomfortably close to our position. Finally, after what seemed like an eternity we consolidated and sat in a defensive perimeter, watching what was left of Shok village smoking and smoldering off in the near distance, waiting for an extraction that almost did not happen. I can remember the ODA 3336 commander, Captain Kyle Walton, telling me that he received message traffic that there was some inclement weather rolling in and the exfil birds were not sure if they could make it to our extreme altitude under the current weather conditions. To make things worse, we received intelligence that the enemy was regrouping on the other side of the ridge and planning a counter attack on our now exposed position while we waited in PZ posture. On top of that it was beginning to get dark at the point when about 2/3 of our force had been exfilled out of the valley. The last group of us that remained were starting to contemplate the real possibility that we were not going to make it off the objective on that day and may have to wait for extraction until the next morning at first light. In retrospect it’s a good thing those door bundles never got dropped because a member of the B team loaded blue tipped training rounds for the Carl G recoilless rifle in the resupply and had we needed it to defend our position from another wave of enemy contact it would have made a really bad situation even worse. I can vividly recall the end of that day when the first of 3 or 4 CH-47 sorties ripped through the clouds and landed in the valley to pick up the 90+ Afghan commando Kandak and what remained of ODA 3336, as well as ODA 3312 and the ARF element provided by ODB 3310 . I was on the last bird out of Shok on that day and I can still remember the feeling of relief as the valley began to shrink into the distance as we made our way back to JAF airfield. Photo caption: Staff Sgt. 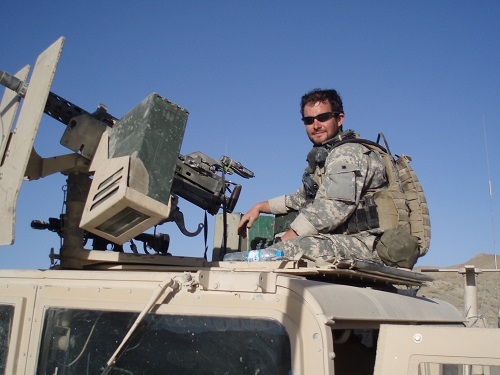 Ronald J. Shurer conducting a mission in Afghanistan, circa 2006. Photo courtesy of Ronald J. Shurer II. A lot of guys had their metal put to the test on that day. I am honored to be able to say that I had the privilege of serving with men of such caliber and grit like those displayed by true American hero’s like Staff Sgt. Ronald J. Shurer II. I am proud of and will remember those men that were wounded and killed fighting for the guys to their left and right on that day, on a remote and desolate rock in a valley tucked high in the treacherous and unforgiving snow-covered mountains of Eastern Afghanistan. Congratulations brother; you deserve every honor that you are receiving. Images: All photos provided by U.S. Army news media. Map from Wikipedia (Creative Commons license). Special Operations Task Force 33 was a special operations unit in Afghanistan formed with a nucleus of soldiers from the 3rd Special Forces Group based on Fort Bragg, North Carolina. The 3rd SFGA has had an essential role in building the Afghan National Defense and Security Forces (ANDSF) since 2003. The group has assisted in developing elements of the ANDSF to include ANA Commandos, ANA Special Forces, the Afghan Local Police, and several other police special tactics elements. ODA is short for Special Forces Operational Detachment Alpha (SFODA). The twelve-man team is the basic operational element of U.S. Army Special Forces. 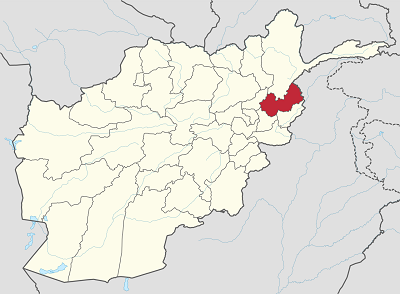 Jalalabad Air Field is located in Nangarhar province south of Kunar and Nuristan provinces along the Pakistan border. ODB is short for Special Forces Operational Detachment Bravo (SFODB). It is a company-level headquarters element that provides C2 for six SFODAs. Video of Award Ceremony. Former Army Medic Receives Medal of Honor for Valor in Afghanistan, Defense.gov DVIDS, October 1, 2018. Video – Staff Sgt. 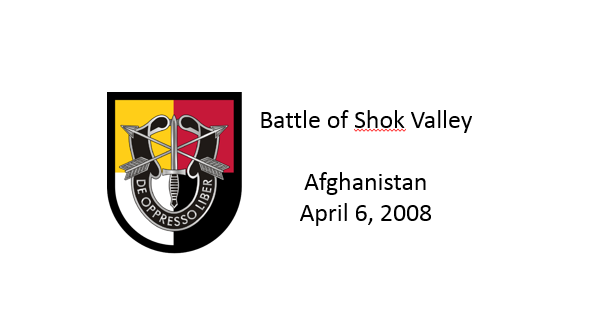 Ronald Shurer : Shok Valley, U.S. Army, December 12, 2018. 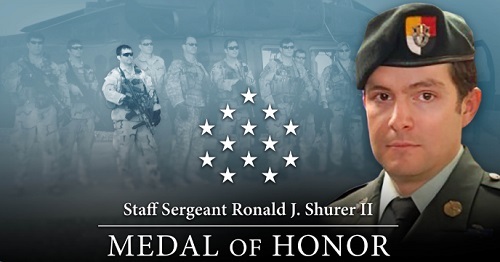 Shurer describes the events that day for which he was awarded the Medal of Honor. Brian Morris is a retired U.S. Army Special Forces Master Sergeant. Serving on active duty for over twenty-five years, he spent the majority of his time in service with the Special Forces as a Green Beret. He is a decorated combat veteran who served multiple tours in Afghanistan during the Global War on Terrorism since September 11, 2001. Brian has been deployed all over Africa, Bosnia, Iraq, Kuwait, Korea, Lebanon, and Saudi Arabia. Brian also taught at the Survival, Evasion, Resistance, and Escape (SERE) School and wrote SERE doctrine for the Army Special Forces including the Army Special Operations Forces Resistance and Escape Manual and the US Army Special Forces Personnel Recovery Manual. Additionally, he is an expert and Master Briefer in anti-terrorism and personal security techniques tactics and procedures. 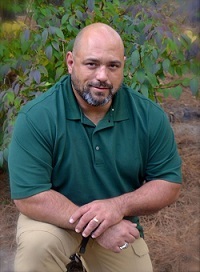 Mr. Morris holds a Bachelor of Arts Degree in Homeland Security from the American Military University. After retiring from the Army in 2012, he spent a year in Afghanistan working as Counterinsurgency Advisor to the International Security and Assistance Force (ISAF) Commander. After returning to the United States in 2013 Brian spent several years working as the chief Personnel Recovery advisor for the US Army Special Operations Command. During this time he wrote his first book on terrorism awareness called the Green Beret Pocket Guide which was published in 2014. After being diagnosed with leukemia in 2015 he took 2 years to fight his way into remission and by 2016 he was back to writing. His second book, SpecOps Shooting, was published in 2016. Brian has also taken on a monthly writing commitment with American Survival Guide Magazine. In 2018 Brian’s third book, SpecOps Bushcrafting, was published. Today, Brian continues to write as well as doing work as a personal security consultant for high risk travel and running a wilderness survival school. He is married and the father of 3 grown and successful children. Brian lives on a small farm in central North Carolina with his wife and their dogs.